Heavy Planet : Album Review - Buffalo - "Los Dias Lentos"
Album Review - Buffalo - "Los Dias Lentos"
Another quality stoner band has heretofore escaped my notice. Another superior purveyor of the stoner genre who has been around for a significant period of time and who has manufactured some sweetly sublime stoner sounds throughout, has simply not come to my laggard attention until quite recently. Just as with any rock band worth their salt, sooner or later they will be heard, their music will rise through the cracks and fissures of the ubiquitous swell of procurable music that is now ever present in all directions. Music such as this will always be found in due course by those ever vigilant souls that constantly scour the rock and roll and stoner universes for the best, the most interesting, and the new. For many of you this band won’t be a new revelation, so kudos to you. You have been privy to some great stuff for nearly a decade. For me they are excitingly new, and with their May 2012 release of “Los Dias Lentos” (The Slow Days) I have found a great discovery point for what they have to offer. It has only 4 short tracks, but they are of the finest quality stoner music, so, for me, they are worthy of adding to that salty collection of worthwhile music. Buffalo sounds a bit like Lot Natas for the oldest and most common of reasons. 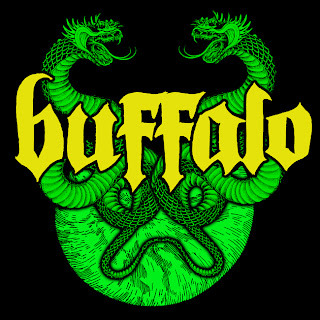 In 2002 Claudio Filadoro left Los Natas and struck out on his own, writing his own brand of stoner rock, and forming Buffalo as the vehicle in which to express his musical handiwork. From 2003 until now, Buffalo have recorded or have been involved in several albums, EPs, and compilations. Perhaps the most notable was the split album “Astroqueen vs Buffalo” in which they laid down five tracks to the Swedish stoner band’s six. This is notable because here you have two artists who have an enormous amount of potential, ability, talent, and quality, but who have not quite been given the recognition in mainstream rock that perhaps could have been tossed in their respective directions . . . just like a great many stoner rock bands. As a whole “Los Dias Lentos” delivers a powerful and athletic sound, deftly rendered and skillfully conveyed, with large and loud guitars cranking away at the low riffs as well as the higher solos, a bass that is huge and booming, making itself heard and appreciated throughout, skillfull drums that punctuate and penetrate in superb fashion, and vocals that are adept and muscular, adding a flavor of Argentinian soul to superb sound of the music. “sabia que iba a morir” (knew he was dying) kicks off the album with a bang, nary a whimper, rendering a toothsome sound that first utilizes twin acoustic, electric guitars and soulful, powerful, heartfelt vocals before the bombardment of bass and drums that lead the way into a classic stoner rock sound complete with head banging refrain and heart beating choruses of melodic bliss, intertwined by scintillating and scorching solos. Fun, loud, and unique guitar work starts off the second track, “tropico”, where Pastor renders a unique and intriguing sound with the guitar work throughout. The beat is fierce and fast, with a head banging tempo of the highest caliber. The Blood of the Wolf, or “sangre de lobos” defines the third track, another fine rendition of loud and insistent guitar work and a great stoner sound, flavored in places by unique and intriguing guitar work. “el dia del peleador” (the day of the fighter) has a bit of a psychedelica feel to it in its beginning with trippy guitar work accentuating a sing song vocal telling of the tale that slowly grows and builds along with guitars, bass, and drums that gain in intensity along the way until the final cut away to silence and appreciation. It’s short, but it’s more than sweet, more than delicious, it’s quite filling on its own because the songs contained therein are all superb, well rendered, well written, gems of stoner heaven. If, like me, this is your introduction to Buffalo then you are in for a treat as the rest of their music is out there just waiting to be played and enjoyed. This is an update to the review of Buffalo’s “Los Dias Lentos”. The band had this month digitally released 4 songs on Bandcamp, but actually have 12 songs for the album, leaving my review quite incomplete. In fairness to this great band from Argentina I would like to complete the review by touching upon the remaining 8 songs. The title track to the album, “los dias lentos”, or the slow days, plays like its title, with a slow, measured tempo that is steady, forceful, powerful, loud, and boiling over with heavy hitting guitars and heartfelt vocals, punctuated by a constant drum barrage and rumble of bass, with underlying guitar solos throughout. “silencio neurotico” (neurotic silence), just as it predecessor, is another measured, down tempo onslaught of fuzz and fury, with drum hook punctuation through the opening third of the song. The song then moves into a changeup that is faster, more urgent, interesting and intriguing, adept in its formation of something sleek and powerful. Buffalo are great at creating song structures that are fun, interesting, clever, and satisfying. A candidate for best song on the album could very well be “la ultima puerta” (the last door) with a terrific beat and tempo to open the song, sing along vocals, and catchy, fuzzy guitars that eventually make way for a unique and totally intriguing guitar solo to close out the song. It is impossible to catch your breath when listening to this album. “unida” (unity) blasts off with more of the perfectly structured cadence and rhythms, guitars perfectly distorted and loud, drums punchy and perfect, and a rambunctious bass that drives the song along, all slowly building upon individual pieces that blend perfectly together, growing in intensity and pleasure until the solos deliver you to the end. Another candidate for best song of the album. The tempo on “los ojos de dios” (the eyes of god) is faster, more upbeat than the previous tracks, with stringent strings accentuating the roll along attack of the opening stanza before moving into a ferocious downbeat of distortion and furor. “los arboles” (the trees) opens clean and sweet before moving into the force and fuzz of the main verses. The vocals harmonize over the melodic tempo of huge, muscular guitars, moving along forcefully, full of interesting sound. Acoustic guitar played with Buffalo’s characteristic heart and passion, along with a haunting, yearning vocal undercut by guitar that is itself harrowing and austere, striking deep into the soul, constitutes the passionate and powerful “mi despedida” (my goodbye). “la ira” (the rage) closes out the album, with an all out onslaught and attack of up tempo, forceful, powerful, structured, and unyielding vocals and instrumentals. Nothing is held back here, as the energy served up is compelling and commanding, impelling the song along an offensive of pure distortion, fuzz, and relishment. Buffalo have that unique blend of talent of melody, and talent of instrument, creating song after song that is memorable in structure and wonderful in execution. Any song on “los dias lentos” could replace the songs that play incessantly on your local ‘hard rock’ radio station. The album itself could easily replace any grammy winner from the past decade. This is a talented and dedicated group of musicians that thankfully enjoy creating, playing, and sharing their tremendous blend of stoner and rock.